to hear about her effort to help homeless sequins. You can read all about it yourself here. pull together a fresh new outfit with some beloved sparkle. recently happily found at Target. oxford stripes and embroidered jackets. equal a modern variation on a classic jacket. rough edge linen pants and sandals. especially when juxtaposed with overalls once again. gives it a much hipper vibe. Sequins are the perfect topper for a shorts suit. Sequins are always the perfect backdrop for accessory collections. 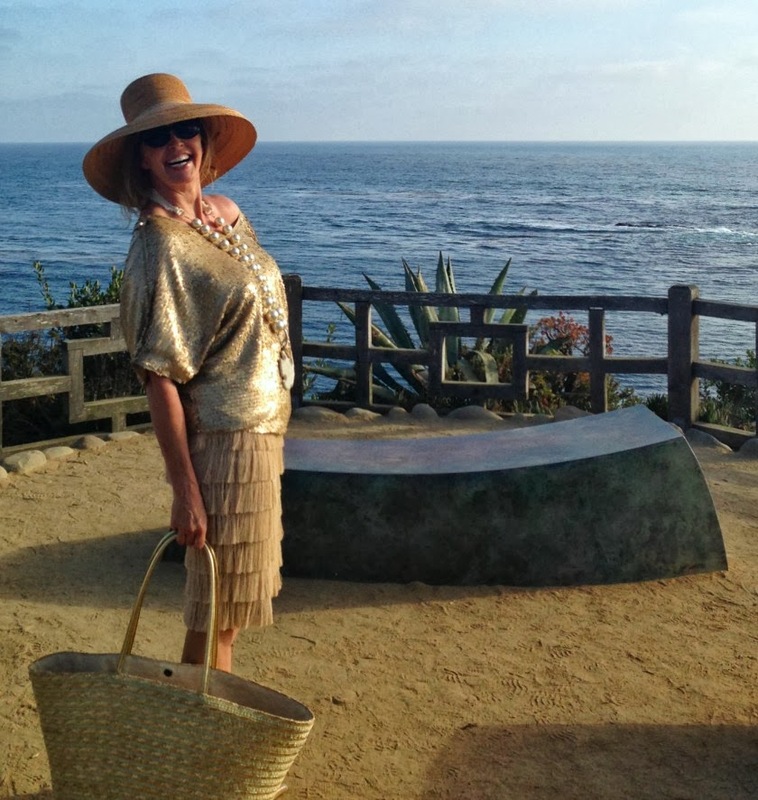 sequins are always the best for a sunset beach stroll. isn't this blogging such a perfect way to find kindred spirits. You do wear your sequins well, Tamera! I think you just gave me the courage to pull some out that I had put away! I love the bottom top...love the way it hangs! Loved all of the looks...gorgeous, as always! Pam... with your wonderful styling abilities theses days... I know you would have fun working with your sequin pieces! I will be anxiously awaiting to see what you come up with! Writing to you... I just remembered I Need to get that Chico leopard scarf... putting it on my to do list for this week! thank you for the inspiration! made by your mum? How wonderful is that? You and FF - match made in glamour heaven. My mother was quite the sewer... making many of my clothes when I was young. My parents even owned a fabric store when I was in high school... which was a bottomless source for creative inspiration! I so enjoyed your sharing the Scottish countryside... Scotland is on the top of my to return list. First of all can I just pick myself up off the floor after swooning over that divine cape your mother made? It's glorious! Sorry you missed out on the Glastonbury tickets... heard how they sold out in under 2 hours... but your dress!! You certainly channeled your disappointment in an amazing manner! 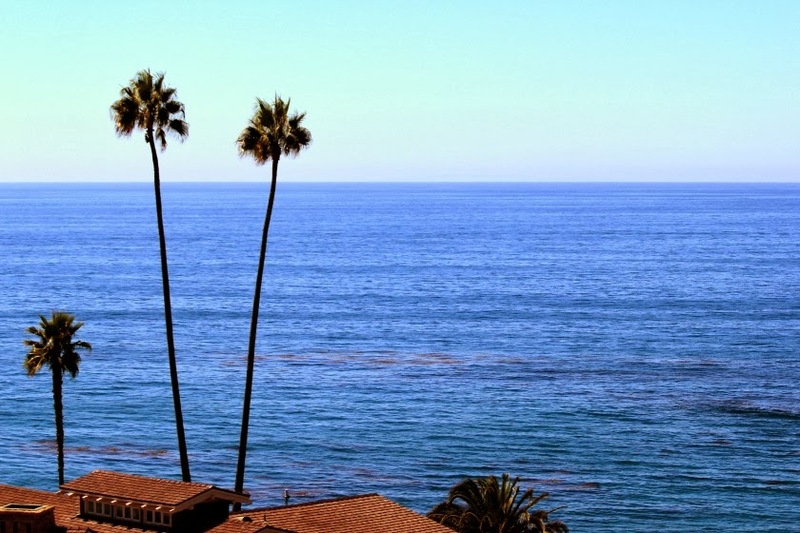 Vannessa with your keen eye for finding magnificent beauty... I have no doubt you would have all you need to create some wonderful ensembles! Thanks so from dropping by from London... or are you in Spain now? Gorgeous, Doll. Your sequins do not outshine your fabulous smile!! Thank you dear Jennifer! I will email you today with an answer to your question my dear! Gorgeous! Long live the Sequin!! 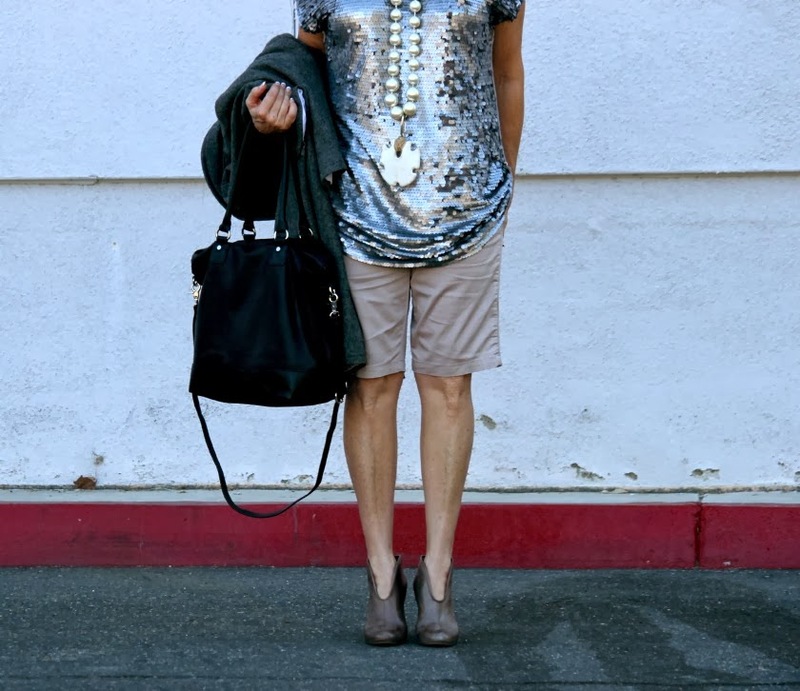 I have your gold sequined tank you are wearing with an oxford! Very fresh and chic! Thank you Shon! Yes, long live, the often maligned sequin! I enjoyed your hair sparkle post! Kudos my dear for celebrating your own beauty... you are truly gorgeous! 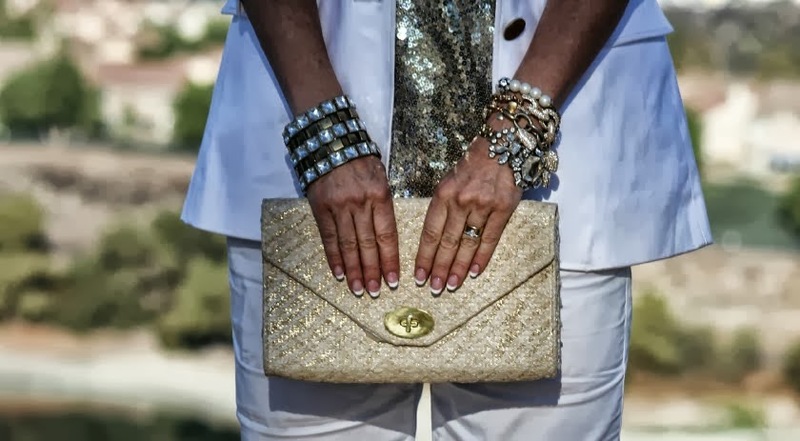 Gorgeous ways to wear sequins, all looks are beautiful. Thank you Josep-Maria! I enjoyed, as always your latest style round up! such a pretty [and sparkly!] post. love it! so happy to see a sweet, sweet comment from my darling daughter! Thank you so very much... your kind words are very much appreciated!! Hello my dear Heather! So very excited for your visit Sunday to our little abode! I was just wondering myself, this morning... what to wear... what to wear ?? I was just re-organizing my closet (putting the really summery things away and bringing out fall/winter -- it's still warm here in AZ) and I was going to keep the "sequins" in storage until the holiday season. Your post has inspired me to bring them out and wear them year-round. Thanks! Heather... I have seen your styling abilities... Yes! Bring your sequins out to play... You'll be very happy you did! I think they would be absolutely perfect under your motorcycle ensembles... talk about a perfect juxtaposition! Please share pictures! You always look so glamourous! Like you just stepped off the Queen Mary. Those sequinned trousers are da bomb. In fact it seems like you have an entire closet full of just sequins. Lucky you. Who says playing dress-up ends when you grow up? Suzanne... I think playing dress up just gets more fun with age! Letting go of the bridle of other people's opinions... and tapping into one's own creativity... can be one of the true rewards of aging to be sure! Thank you dear Helga! Congratulations on your Avenues magazine cover... so very well deserved! Thnk you for your visit from New Zealand! Sad to say I don't own a single solitary sequined thing! I must give some little sparkles a home. Once more: inspiration from Tamera. What Connie! Someone with your huge verve for life... and no sequins?? You Must find some to bring home... you will be surprised how much sparkle and joy they can add to your day!! Tamara, you are gorgeous in all these! I need to add more sequins in my life. I'm missing the party! Yes, Kim... you do need sequins!! There are still so many out there who need a good home!! I just know ... you would give them a good one!! What an array of gorgeous sequin looks! Each and every one a winner and marvellously glamorous on you dear Tamera. Thank you dear Emalina. i am still struck by your provocative relationship quote... i will be mulling this over to be sure. I always so enjoy your visits from the British West Country! Glamorous inspiration! I have plenty of homeless sequins, and I think they need an outing. Oh Judith... I can only imagine your collection of sequins... can't a wait to see pictures of their outings!! You could be at home in Town and Country magazine. I think you look amazing! Thank you for your kind words my dear... and for your visit from British Columbia... your fall weather sounds amazing to me! Ok, Im sold. Now I want a sequins top! Love this post. Great ideas. Thank you Glenda! 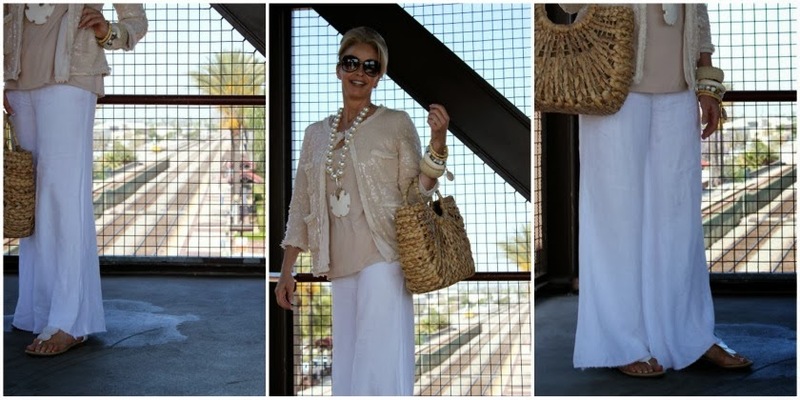 Loved your latest SoCal look! 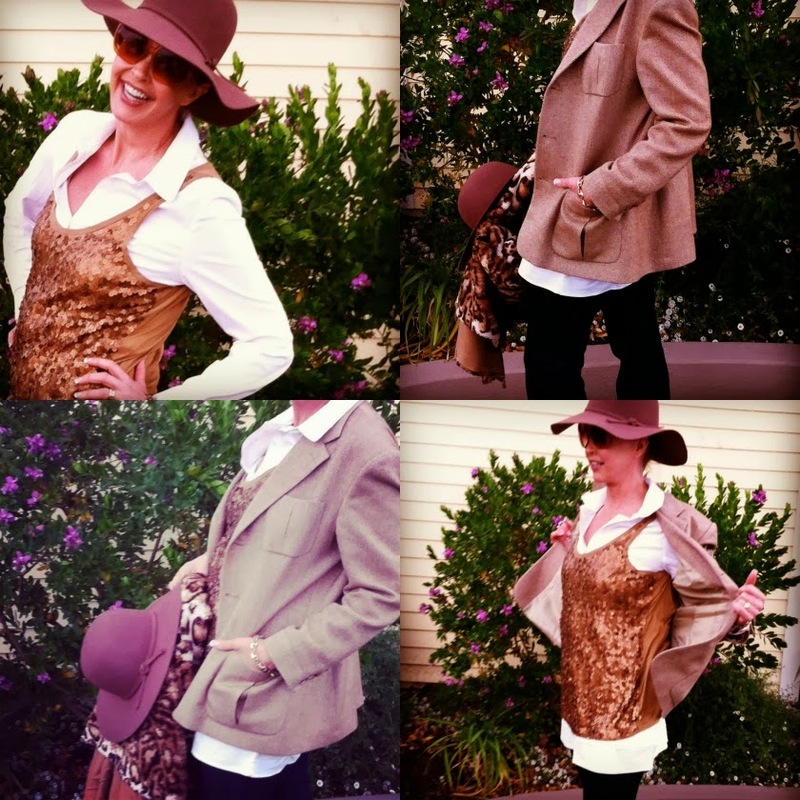 Am loving these outfits Tamera, thank you for posting so many ideas- am inspired! Susi G.
Thank you Susi ... you are more than welcome! oh wow, everyone of these looks is so lovely! very old glamour! I love sequins!!! I can't resist the sparkle. You've given me lots of ideas for styling my two sequinned tanks that are begging to be worn. And! Your cape made by your Mom is stunning! Just one beautiful photo after another ... you are such a lovely creature! And so good of you to care about the homeless sequins ... it's the defining fashion issue of our time. Not many understand that the way you and I do! No kidding, though, you are gorgeous in casual sparklies or formal sparklies! love the look. And I'm absolutely crazy about your boots and cape I wish you a good trip.